One day you might hear strange sound from your hard drive. The computer hangs when reading/writing files, cloning partitions, formatting/checking the disk. Windows finally fails to start up after bitter attempts of reading data from HDD. The disk volumes disappear in the Explorer. Well, all these are probably caused by bad sectors on your HDD. To fix this problem, you can isolate the bad sectors so that OS will ignore/bypass them. 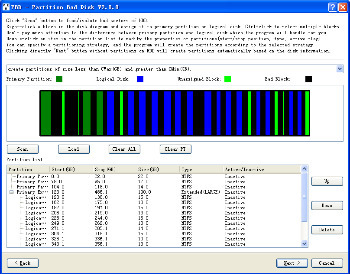 PBD (Partition Bad Disk) can do all these annoying things for you by detecting/isolating bad sectors and creating healthy partitions. You can also adjust the properties of partitions such as the size, the start/stop postions at will, just like an ordinary partition software. The second bad block isolation method is marking bad clusters in the file system. You can now use PBD Super Format option to format the partition and hide bad clusters smoothly.